Sync advocate records and activities to contact records in Salesforce. Best of all, you don’t have to pay for this integration. Our Salesforce API is provided free of charge to all clients of One Click Politics clients with an active Salesforce subscription. Need a robust membership management CRM to build an army of supporters for a cause or issue? Look no further than Nationbuilder. Countless organizations in the United States, Canada, and Australia use both Nationbuilder and One Click Politics to affect policy change. iMIS is a cloud-based solution for nonprofit, association, union, and membership management. It offers a wide range of optional features including membership, fundraising, online payments, website management, email marketing, events, product sales, education & certification and more. With a team of former non-profit veterans steering your development priorities; Neon CRM is our platform of choice for clients who need to kick their fundraising efforts into high-gear. 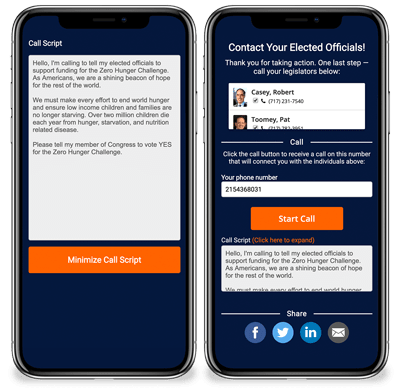 If you conduct grassroots advocacy campaigns; then you need a robust legislative tracking solution to help you monitor the status of pending legislation. TrackBill is the fastest and most affordable bill tracking solution available. Are you on a shoe-string budget? Does your non-profit literally keep a penny jar in the cafeteria? Then Kindful is your answer to enhancing your donor management program without breaking the bank. We are here to help launch your next advocacy campaign.